This fresh floral fragrance features a delicate balance of inspiring Italian Bergamot blended with Violet Leaves to relax and soothe the senses. The scent is enhanced by a note of Soft Muguet and gentle Jasmine Petals, with a Soft Cedar and Warm Amber background. 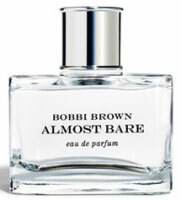 Bobbi Brown Almost Bare is available in 45 ml Eau de Parfum, and can be pre-ordered now at Neiman Marcus. Many thanks to SueS for the tip! The most recent fragrance launch from Bobbi Brown was 2006's Bath. What a coincidence for I have two Bobbo Brown frags on my pulses today: BB Bath EdT and Bobbi EdT. These two are ok, very fammiliar, not too special to me but nice light and feminine. I think that BB is wonderful with cosmetics, very good colours very fine products, but I wonder why she does fragrances. I'm guessing her fragrances sell well — they're light & clean & fresh, and mostly inoffensive. Bath was a puzzle to me, but I think it is the sort of thing many women are after. Bath I like much more than Bobbi and it is inoffensive indeed, something to wear while sitting on a terrace on a nice summersday or strolling along the beach or sleeping with. Come to think of it: if my sheets would smell like Bobbi Brown Bath, then I would love it! Will try the other BB frags as well asap.Yes! I still haven't yet seen Bath anywhere in the UK. Maybe us Brits don't have the reputation for wanting to smell clean, LOL? You know, I almost missed it in the store myself — the packaging is beyond what you'd call “basic”. But if the UK didn't get it, no loss to the UK. Almost Bare…well why not just go scentless then? at least this one isn't another fruity floral. soapy clean i can deal with, but not a cloud of stuff that comes from a pink plastic bottle… sounds okay, someting you might want to put on after a shower or a day when you feel like going almost scentless (is there such a day? )… or maybe when i see my mother, she hates all perfume! uninteresting but at least it doesn't contain les prix d'eaux faux-esque notes… no “precious jellied crystal blackcurrant” or something of that sort, just clean, soapy notes! Almost Bare had me with the violet leaves, then lost me with relax and soothe. LOL at “filthy skinking Brit” ! I do have such days, and then I wear Thierry Mugler Cologne or my old cheapier standby, Body Time Egyptian Musk. mugler cologne is nice. my equivalent of that is l'eau de cartier or l'eau du sud. my favorite cheapie is also a musk scent, body shop white musk perfume oil! I like Eau de Cartier & Eau du Sud too…have not tried the TBS version, but should! I get a headache going in that store though. Agree, full blown knock 'em dead scent or none at all.